We went to Splash Adventure just outside of Birmingham first, then made our first-ever (but most certainly NOT our last) visit to Spring Valley Beach, and finally went to Point Mallard last weekend. We barely made it before they closed for the season, but we did it! 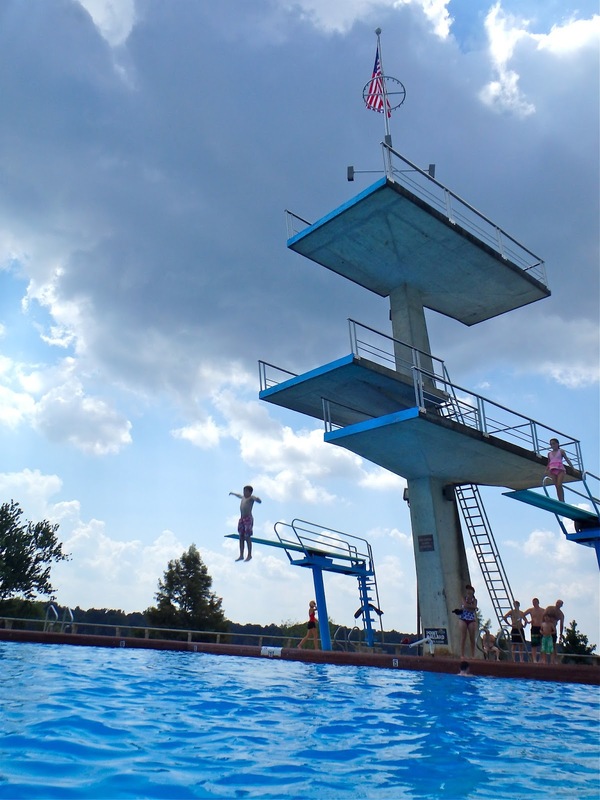 We had been to Point Mallard once before, and what the boys loved most about it was that it has lots of diving boards. 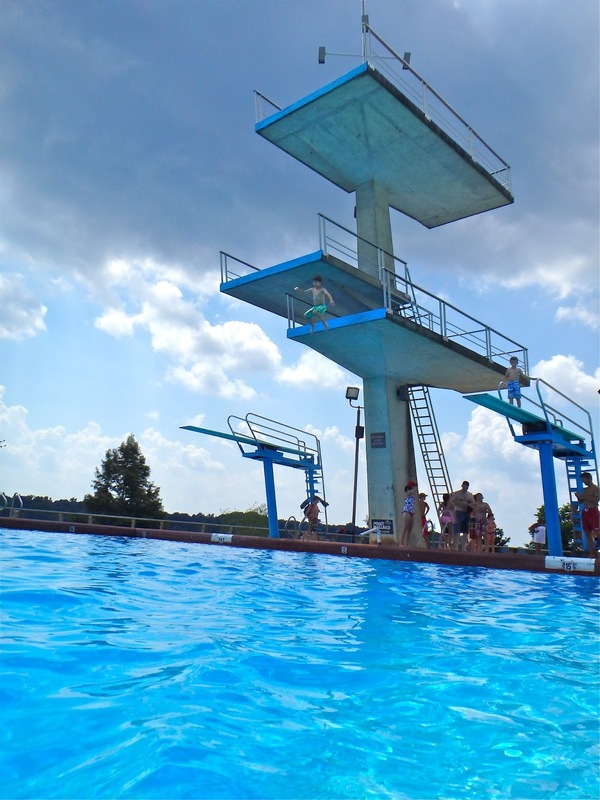 And not just your garden-variety diving boards, Internet ... they have HUGE ones. Nathaniel was so excited when we got there that he jumped in before I could even get sunscreen on the other boys. I had to pull him back out of the pool. I asked, "When have we EVER gone ANYWHERE when I didn't want to get a picture of you before you ran off?" He had no answer for that. Because the answer is NEVER. One of the things I love most about Point Mallard is that it's set right on shore of the Tennessee River, which is hilarious because the lake is so calm and quiet -- the POLAR OPPOSITE of the waterpark. But Nathaniel just walked to the edge and hopped right off! No biggie. He did it about 20 more times that day. 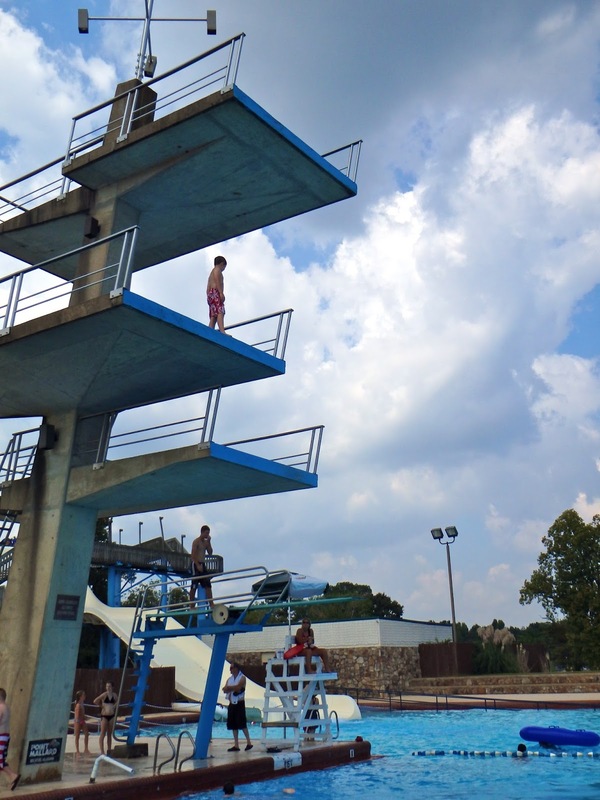 Although Nick likes the taller boards, too, his all-time favorites are the lower springboards directly across the pool from the platform boards. He must have jumped, dived and flipped off of those more than 100 times that Saturday. 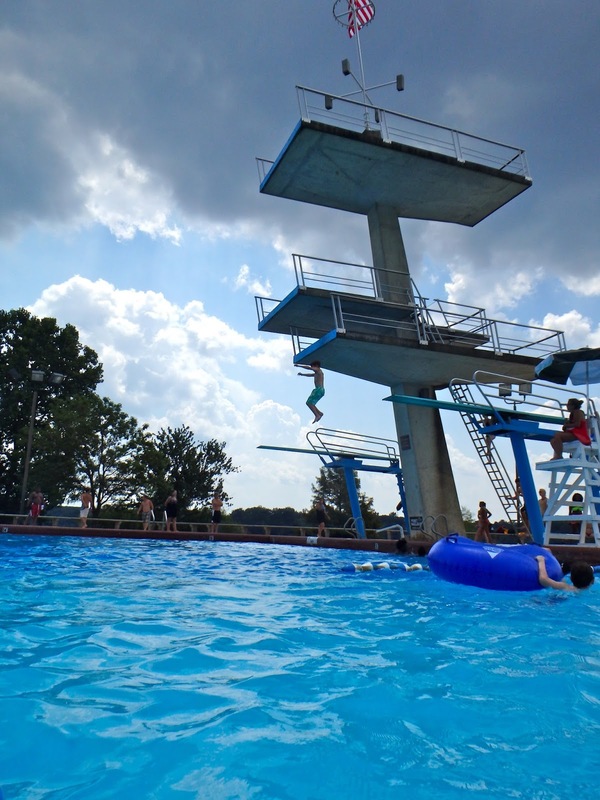 Another thing I like about Point Mallard is that if you have kids going off the boards and the big white slide you see in the background, you can either stand on the side of the pool or in the middle of the four-foot section of the pool and be able to see all of them at the same time. I ended up having to do that a good bit of the time when Grayson, Nathaniel and Jake headed to the white slide but Nick wanted to keep jumping off the boards. To take the next set of pictures, I was standing in the pool near the high dives and about 20 yards from the base of the white slide. The second time, he went down with Nathaniel. 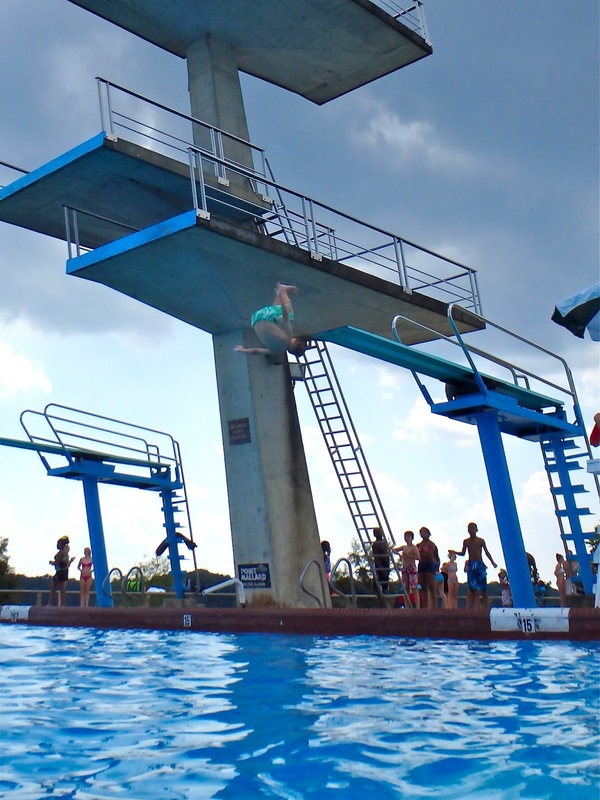 Then it was back to the diving boards. 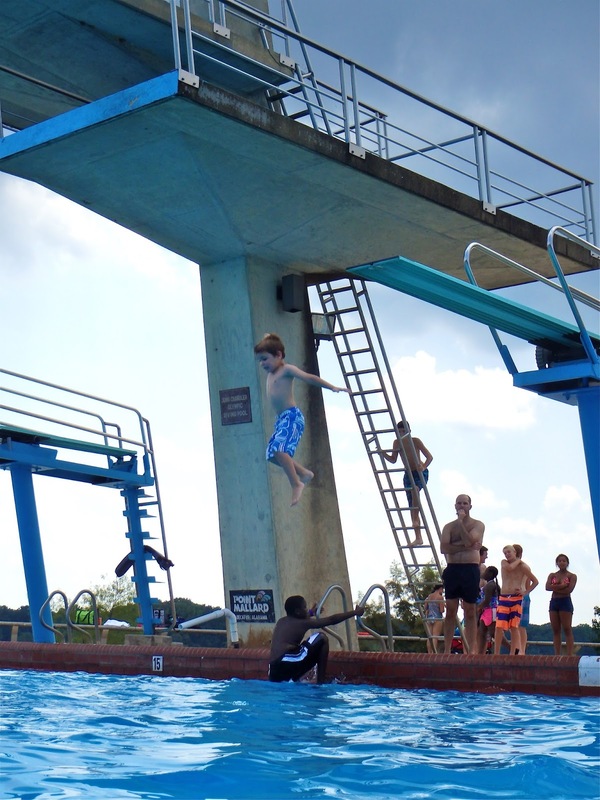 All day long, Jake was the smallest kid in line for the high dives. It cracked us up, but every time he went off, most of the people in the pool would turn to watch him go. Some people even clapped for him. There were kids three times his age who walked all the way out to the end, then turned around and walked back down the ladder. But Jake was THRILLED to do it over and over again! He was desperate to do the lowest platform board, although I didn't want him even to try it. But he insisted on going up. He made it to the edge seven or eight times, and even curled his toes over the edge, looking over repeatedly. But he just couldn't bring himself to step off. Strangers were cheering him on from the pool, so impressed that he'd even made it that far. And he made me laugh so hard, because he stood there at the end of the board with his arms crossed, a scowl on his face, as if he wanted ME to make it happen. 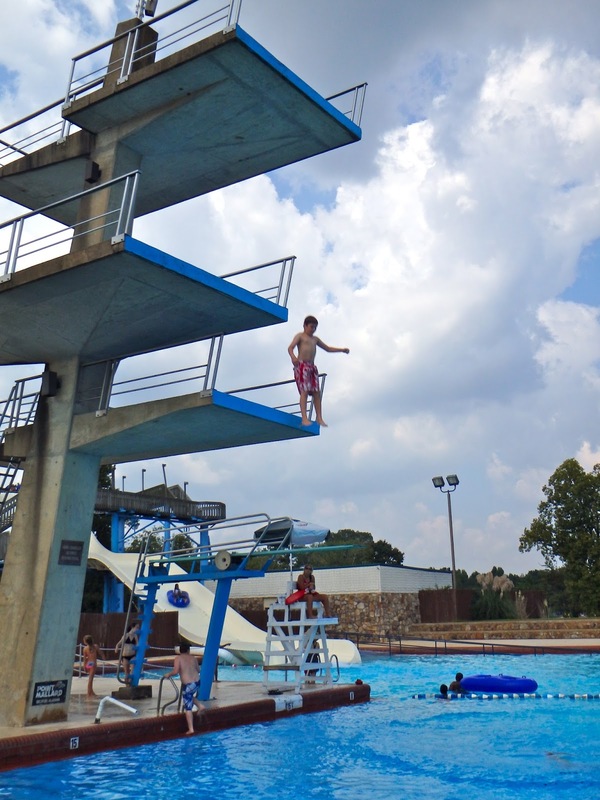 Nick worked up the courage to do a front flip off the high-dive! That was a really big deal for him. Nathaniel continued his streak of jumping off of the second-level platform all day. He inspired Nick to try it, too, and at times the kids were able to coordinate their jumps. This one didn't quite work out for Nick and Jake, but a couple of times Nathaniel and Jake were able to jump simultaneously. This year Point Mallard installed a new Lazy River, so we hopped on over there to try it out. 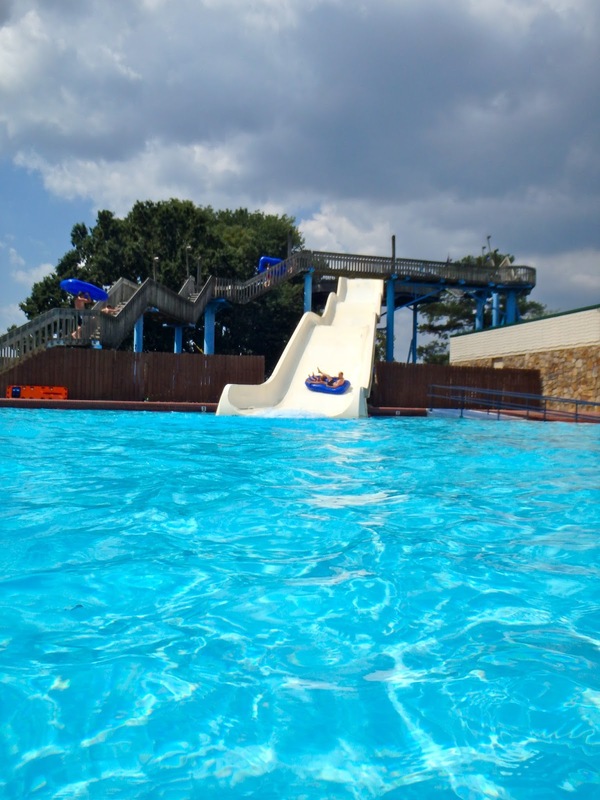 One of the drawbacks -- in my mind -- of Point Mallard is that you have to walk across the park to get to the second set of waterslides and the Lazy River. They're not all located in one area. BUT it was worth the short walk. It was really clean, and the current moved pretty fast. There were plenty of tubes for everyone, and we went around two times. Our next stop was the set of slides at the far end of the park. I rode the center slide once, had a great time but almost lost both contacts, and then settled at the bottom to take pictures of everyone else coming down. I think I've come to the conclusion -- as visiting three waterparks in two months might lead one to do -- that I need to wear goggles on waterslides. The unexpected sprays to the face are bound to make me lose a contact or two at some point, and I can't even drive without my contacts, so that would be a disaster. 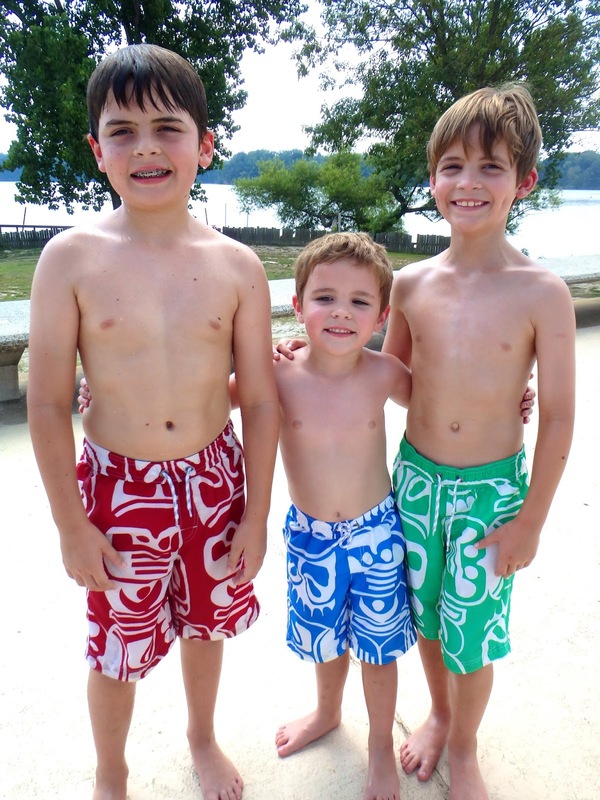 While Grayson, Nathaniel and Nick stayed on that side of the park and rode the slides some more, Jake asked me to take him back to the "beach," which is an area on the lakeshore that's been carved out for Point Mallard visitors. It's guarded, roped off from the rest of the lake at about four-and-a-half feet depth, and there's plenty of room on shore for building sandcastles and relaxing in the lounge chairs they provide. 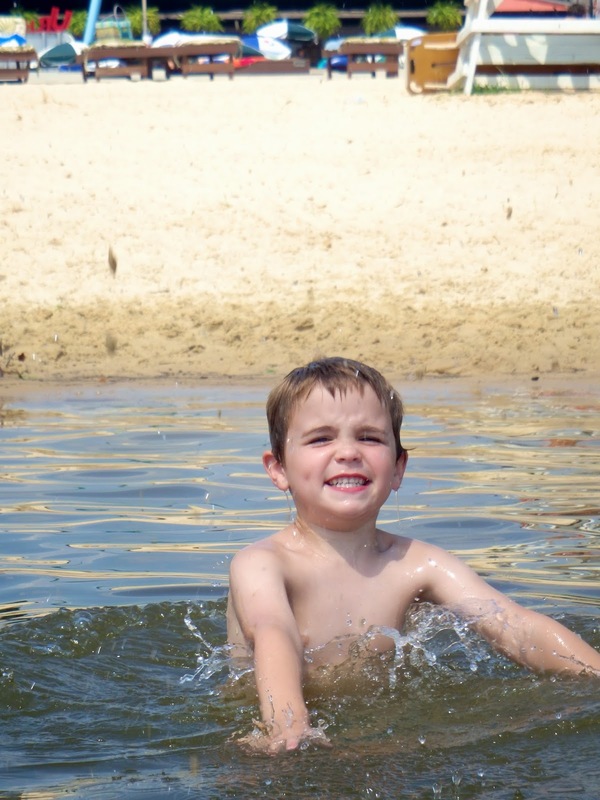 Jake said he wanted to "play in the lake," which apparently to a 5-year-old means "throw sand." I had to tell him not to throw it directly AT me, but he didn't mind it landing in his own hair at all. I don't think any of the people out there on those nice boats were having sand thrown on THEM. Jakey loves a sandcastle, so we made sure to build one, complete with a swimming pool out front. Once the others had joined us again, we walked up to the wave pool, the last unexplored bastion. I couldn't believe the boys were still going, since we'd been there for more than six hours by that time. But they love to squeeze the fun out of every moment, especially when they don't know when they'll be back. Even though the waves were way over Jake's head, he just threw his arms up in the air and dove into each one. This was a great experiment for us as a family, especially since next year Amelia will be joining us on all of our "field trips." Grayson and I decided that it's a much better choice for us to travel the 60 to 90 minutes to the out-of-town parks to vary our adventures rather than invest in Season Passes to Splash Adventure. It gives us the opportunity to do so many different things, and we don't run the risk of spending the money on the passes and then not visiting enough times to really make it worth our investment. We've even talked about putting together a group to go to Spring Valley Beach next year, since they're so accommodating of bringing groups, outside food and drinks, etc. It's in Blountsville, Ala., if any Grass Stains readers want to join us!